They did it. The 2016 IronPigs have clinched a playoff birth. It’s only the second time in team history that we’ve had the privilege. They did it by hanging 5 runs on Rochester in the top of the first inning last night. Ben Lively had a no-hitter through six, when he was lifted for pitch limit. Joely Rodriguez kept up the no-no for two more innings, but Elvis Araujo yielded an RBI single with 26 outs in the 7-1 victory. The Red Wings came apart early with the manager and catcher getting ejected. For the second week in a row, a team celebrated in the visitor’s clubhouse in Rochester, as Scranton clinched there as well. DH/1B/LF Darin Ruf and LHP Patrick Schuster and RHP Colt Murray were called up to the Phillies as rosters expanded Thursday. INF Andres Blanco was activated for Philadelphia as well. RHP Jimmy Cordero was promoted from Reading to Lehigh Valley. He can touch 100–hit 103 in Reading last season–but is still coming back from a shoulder injury. LHP Tom Windle comes back to Reading from Clearwater. Good seats remain for this game, but are limited. Purchase before going to the park. Unless starters get shuffled to prepare for the playoffs, RHP Nick Pivetta (0-2, 3.20) will take the mound to face RHP Tyler Duffey (1-0, 1.99) who spent most of this season with Minnesota. Good to see. Good to see. I didn’t want to sweat this out all weekend–plus I want to start getting my playoff primer written to prepare you for the best-of-5 series with Scranton, starting Wednesday. The primer will be titled, “Get The Red Out” in case someone else steals it. We’ll see how the teams look tonight. 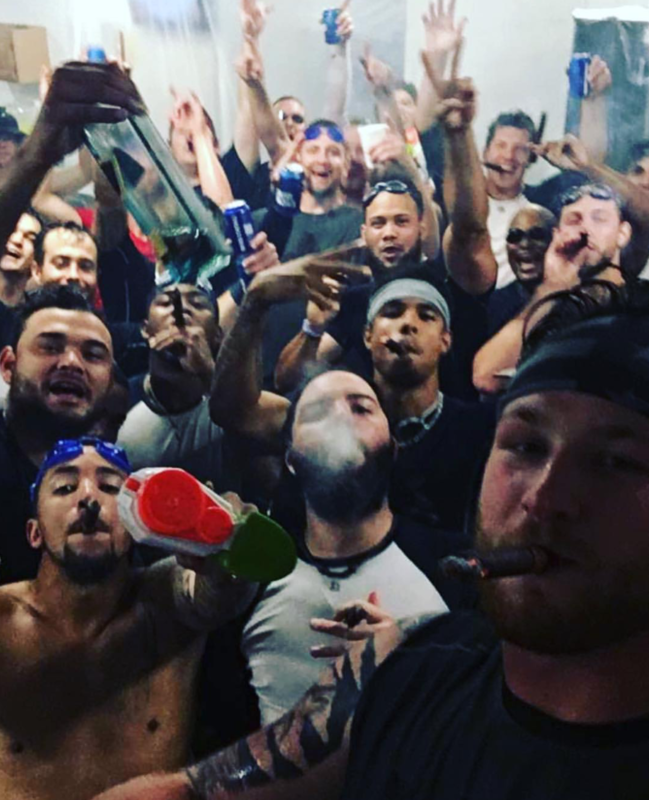 Will the IronPigs be hung over from a late bus trip full of cigars and champagne? Will the RedWings give up? Will Brundy do anything different with the lineup? Those are your story lines for tonight. Tomorrow’s game–Sunday–is a 6:35PM holiday weekend start. Bethlehem Steel FC plays at Goodman at 3PM if you’re looking for something to do before the game. Monday’s game is a 1:35PM start, and had originally been a nice pitching match-up with Berrios facing Klein, but that could all change now. Personally, I’d hold Klein for playoff game one on Wednesday. We’re planning pre- and post-game tailgating–as we’ve done for the final game of the year for the past five seasons. Stay tuned for details. Tuesday will be an ‘off’ day, and the series with Scranton starts Wednesday at Coca Cola Park. Good seats are still available; the second game will be on Thursday. Both are 7:05PM starts. On Friday, the series shifts to Moosic, and we’ll either head up there–or to Reading if they clinch their division. Stay tuned if you want to join us either way. Should the IronPigs be fortunate enough to win the Scranton series, they’ll face the winner of Columbus vs (South, prob Gwinnett) next week starting Tuesday at Coca Cola Park. So whatever happened to the Phillies’ pledge that they were only going to call up 2 relievers from the ‘Pigs, and that they wanted to let the playoff teams alone? We’ve had some trouble scoring runs as it is; now, with Ruf gone, it will be that much more difficult! I had picked up a quote from Mackanin “a couple arms” reported by the Philly beats. It was a truncated quote; the complete quote added “and maybe a bat.” They took one good bat but left us most everything else including our closer, Garcia. We’re at 23 on the roster now; I’m wondering if we get something else back–but I can’t imagine what or from where. Stay tuned. Who Says No One Cares About the IronRail Trophy? I care as much about the quality of the Philadelphia Phillies’ life at the Major League level just as much as the organization cares about the Lehigh Valley IronPigs’ quality of life here at the AAA minor league level. Congrats Pigs!! Don’t worry about roster, look at Scranton’s roster, looks like a gulf coast roster. Weird things happen this time of year, can anyone remember when Andy Pettitte did a rehab start for a Trenton game? FYI– he lost—- enjoy the playoffs, let’s get six wins! Anyone wanting to watch the games, join the pretzel guys in Florida– hopefully Howard and Duece will come down also— there is a lot we miss at the ballpark, but those two guys were truly awesome!! Herzlichen Glueckwunsch an die IronPigs! Hoffentlich, koennen die Phantome Playoffs in diesem Jahr auch stellen. Vorwaerts zum Sieg. Auf geht’s!